Tired of feeling alone in your marriage? Without this, your marriage won’t change. I experienced the benefits of what I’m about to say over the weekend. Bear with me for a moment as I share with you what happened, and the small but BIG benefit that comes! Tears began to fill my eyes as I walked my husband around my garden. The landscaper didn’t weed the right plants, even with directions. My beloved thyme patch was nearly gone. The patio was a mess. My son who gardens with me was furious. Some may think this is small, and in the big scheme of things in life, it is. I have had chronic DeQuervain’s Tenosynovitis for over a decade. It’s painful. The bottom line is anything “pinch and grasp” motion-wise hurts. A lot. I’ve been told I can’t have surgery to fix it because of my connective tissue disorder. Think can’t chop vegetables, pick up books, type for long, pull up your pants or brush your teeth without searing pain. It comes and goes in severity, but the last year has been filled with worsening soreness. I don’t like to talk about it because I can’t change it and I don’t want it to define who I am. Yes, I’ve prayed, and God’s said, “not now.” The reality in the NOW that I’m in is I just can’t do most of the stuff I used to be able to do. That means the beautiful garden that brought such joy and peace to me has become a heavy burden. Don’t get me wrong, I’m thankful for the disability – God has used it to bring much good to my life, but that’s a story for another time. Anyway, knowing this, a week earlier my sweet husband found an entrepreneurial neighborhood college student who started a small landscaping business. He came over and we walked him through the garden to show him the needed work. We found he used to be best friends with the boy who grew up next door, had experience doing lots of similar work, and seemed to have his heart in the right place. So we asked him to weed, mulch, prune, and clean up the garden and patio when he offered to come just a few days later. Unfortunately we picked a weekday when my husband was at work and I had to be away most of the time the workers were there also. It didn’t go well. Every time this happens, I fight feelings of worthlessness, anger at myself for creating this huge labor-intensive space, grief over the lack of intimate encounter with God I felt as I gardened with Him. It might sound stupid, but for me, the physical pain mingles with the emotional pain of loss and inability, leaving me steeping in a feeling of ineptness. Thankfully those feelings are short-lived, but they still happen every spring to some degree. I asked my husband to get it corrected. As my husband, son, and I wandered around and we showed him the outcome of the landscaper guy’s actions, I got a little emotional. I complained about the guy’s attitude when I tried to verify he knew which plants were which. By the end of our inspection, I could sense my husband felt discouraged. Who wouldn’t be? He found the guy, hired him for me, and was honestly trying to help. And here’s his wife and son, complaining to him, seemingly angry and disappointed. He didn’t say much, but I could tell he was unsettled. He went back in the house as I was leaving to go somewhere with our son, and I realized he might feel like I was blaming him. I took a moment and went back in the house and found him. Even though prior to complaining, had told him I appreciated him getting the landscaper, I’m sure complaint registered louder. He seemed relieved, saying, “Thanks for telling me that. I didn’t know. I did think you were angry at me.” I’m glad I went in to clarify! Choosing blame makes us a victim. Does that mean that someone else doesn’t also have responsibility? OF COURSE NOT. But we cannot control another person – we can only control ourselves and the choices we make. That seems a little harsh, doesn’t it? How is it there is something that is ours to own in every situation? How can I possibly say that to an adult that has been abused as a child? Well here’s the thing – when you are a child, someone bigger and more powerful than you forcing you to do anything isn’t your fault. Once we get older, however, we need to take responsibility for the circumstances in our lives because we are the only people who can do anything to change them. We CAN be victimized as children by abusive people who are supposed to take care of and protect us – but once we are old enough to be in charge of our own lives, it is up to us to not allow our past circumstances to dictate our future. We have to actively choose healing. I need to own my contributions to conflicts and the current state of my relationship because when I blame others, I choose “victim status” and give away my position as an equal heir. Strong and dignified people, those who respect themselves and others, refuse to blame. They instead focus on their contribution to the conflicts and state of their relationships. They don’t give control to someone else. 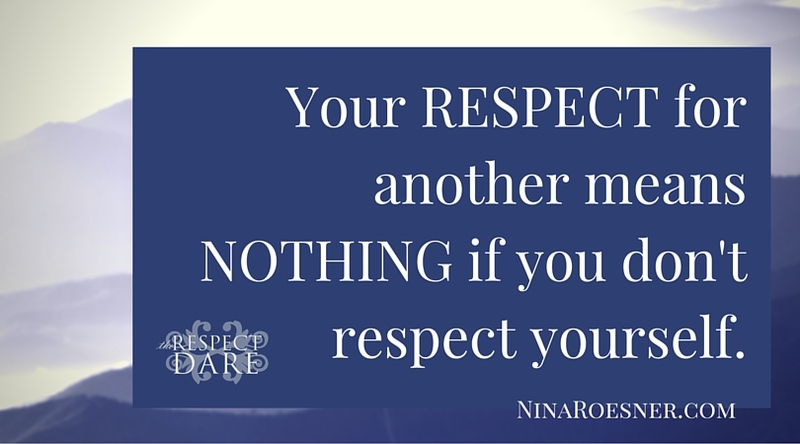 Given that the research shows that others respect us less if we don’t respect ourselves, we need to model these things to our kids. It gives them less to work through as adults. Own the state of your relationships – acknowledge that you have contributed to the NOW you are in and you then have the power to change it. STOP blaming others – for having negative motives, for feeling or thinking or doing things on purpose to hurt you. Even if you are right, the damage you do to your relationship isn’t worth it, and most of the time, these thoughts are lies, and they just give away control. They actually increase the level of insecurity and decrease the amount of trust you have in your relationship. And yes, the other person is also responsible, but that’s not YOUR problem – that’s theirs. If they have hurt you, read Matthew 18 for instructions. You’ll see much of that chapter deals with handling your own faults first and coming at confrontation with a gentle and humble attitude. Assume the best and not the worst about the people in your life – yes you will be wrong sometimes and it will hurt, but more often than not, when thinking the worst that will leak out into the relationship and damage it. Doing these things (and some others) will help you find more freedom and less stress in your relationships. I want those things for you, too! It’s a never-ending journey, one filled with growth, humbleness, and intimacy in our closest relationships. And yes, you will need to work through conflict differently – I’m not suggesting you pretend there aren’t issues. I’m suggesting you change the way you think so that you can deal with the issues in a healthy way, and help others in your life do the same. Whether my husband needed my help with his feelings isn’t the point of the situation with the landscaper, though it could be. The point I do want to make today, however, is that when we take ownership of our own feelings, we can articulate them more clearly to others, and help them not feel attacked. Lead women? Want tools to deeply and permanently impact them? Or maybe you have a lot of conflict in your life and want to change that. I encourage you to sign up for the retreat – Deflating Defensiveness: Create Connection through Conflict. It’s coming up in just weeks, and we still have a few spots open. You need to know you can create intimate connections with the challenging people in your life in the middle of a conflict, or at the very least, lessen the amount of conflict you encounter. The method is proven. It’s based on brain science, research, and it’s Biblical. You’ll also emerge with more peace, more strength, and more dignity. It’s not often that I highjack my blog with a prayer request. I think the last time you saw me do this was when my husband had open heart surgery three years ago. And I don’t want to communicate fear at all. I just want to rally the troops because this is legit. In the last year, we have seen divorce with several top Christian bloggers. You can read the details here. We are concerned and asking for prayer coverage because this year God created Deflating Defensiveness, our training retreat that super-charges our relationship with God and the challenging people in your life, not to mention the people that aren’t so difficult to love. We have seen women in verbally abusive marriages become women of strength and dignity…and turn their marriages around. I have sensed that 2018 is an important year for us and will impact many lives and marriages. I’m also knowing that we have been and will be targeted. By the enemy. And he is good at what he does. Will you please pray for us? And the other marriage and family bloggers you know? Maybe you have sensed things heating up too. Just the fact that you are reading this and are interested in a marriage that glorifies God makes you a target as well. Consider yourself on the front lines with us – and join us in praying for battle victories and protection and perseverance. I don’t want to glorify that other guy, and you may have your own experiences fighting evil. Let me know how we can pray for you today also! !